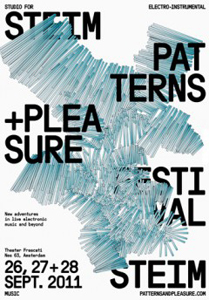 STEIM (Studio for electro-instrumental music) organizes Patterns + Pleasure, Festival for Adventurous Contemporary Electronic Music :: September 26-28, 2011 :: Frascati, Nes 63, Amsterdam, Netherlands. Patterns + Pleasure presents the latest and most adventurous contemporary electronic music from today. There will be lectures, workshops, debates and performances by musicians and sound… artists from home and abroad. Starring Alex Nowitz, Tom Johnson, Jessica Rylan, Fuyuki Yamakawa, Steina Vasulka, David Toop, Moldover, Edison and many more. STEIM is working with a growing international network of musicians, performers and visual artists for more than 42 years now. STEIM invites people for residencies and provides them with an artistic and technical environment to work on the development of unique instruments and new music. Patterns + Pleasure provides an overview of the latest creations and developments within the electronic live music. The daily program consists of workshops and a symposium with lectures by artists, writers and scientists on themes such as improvisation, intuition, complexity, and the changing relationships between past, present, and future. In the evening there is an extensive music program with various artists. Many of them will be performing for the first time in Amsterdam.